Happy Monday Morning to you all!! What is "Never-Ending Online Craft Show "
We have monthly seasonal and more themes.. I hope you will stop by THIS Wensday October 1st. 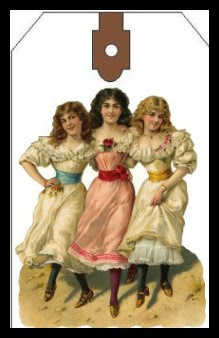 'Don't forget your Sisters,' she advised, swirling the tea leaves to the bottom of her glass. 'They'll be more important as you get older. no matter how much you love the children you may have, you are still going to need Sisters. Remember to go places with them now and then; do things with them. ''Remember that 'Sisters' means ALL the women...your girlfriends, your daughters, and all your other women relatives too. 'You'll need other women. Women always do. 'What a funny piece of advice!' the young woman thought. Haven't I just gotten married? Haven't I just joined the couple-world? But she listened to her Mother. 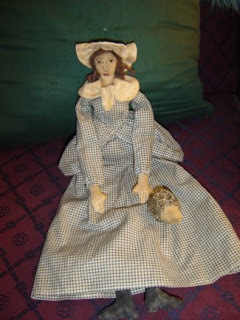 She kept contact with her Sisters and made more women friends each year. As the years tumbled by, one after another,she gradually came to understand that her Mom really knew what she was talking about. When you have to walk that lone some valley and you have to walk it by yourself, the women in your life will be on the valley's rim, cheering you on, praying for you, pulling for you, intervening on your behalf, and waiting with open arms at the valley's end. Mothers,Grandmothers, aunties, nieces, cousins, and extended family, all bless our life! The world wouldn't be the same without women, would I. When we began this adventure called womanhood, we had no idea of the incredible joys or sorrows that lay ahead. Nor did we know how much we would need each other.Every day, we need each other still. Pass this onto all the women who help make your life meaningful. 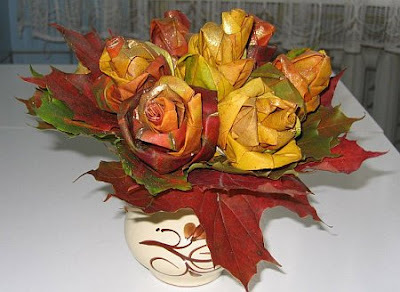 I found this tutorial on LittleRuffledFeathers how to turn fall leaves into roses. I just love them and they are just gorgeous!!. You that have beautiful Fall leaves ,Give this tutorial a try.. We will be leaving for North Carolina and Tennessee on October 25th..You better believe I will be gathering oodles of fall leaves! 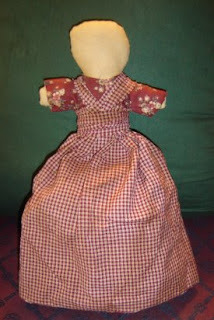 My doll making friends ask me why I love aprons, I think their checking me out to see if I have lost me stuffings..In Life in general there are times you just need a lift! Wear an apron! 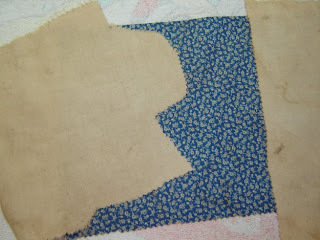 Create an apron that is Vintage from yesteryear, Victorian... Or how about creating an apron just for your self ... Your very amazing personal own style!...the sky is the limit! 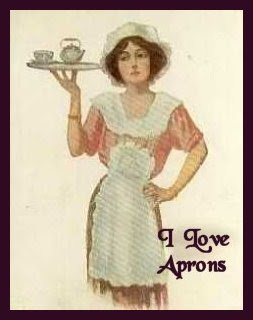 Apron's really do make us feel good , and up lift our moods!! Come On Join me in The fun with this FUN!! Aprond Swap!!! 1. 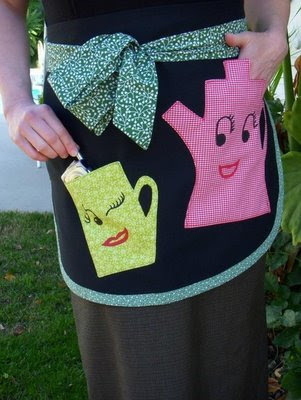 *Create an apron (half or full) for your partner. 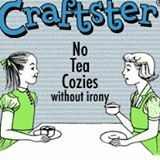 There are loads of fun fabrics out there with tea pots, mugs, drink glasses, coffee beans, tea cups, etc. on them. 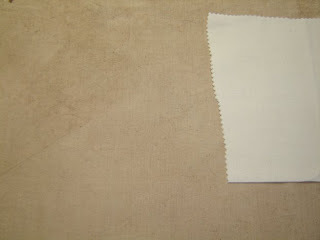 If you can't find the right fabric, you could applique, embroider, etc. Add at least one embellishment. *if you cannot sew but want to play along, you may purchase an apron from one of the crafty people on etsy. 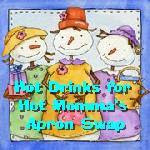 No store bought aprons please, they are not considered hand crafted. 2. 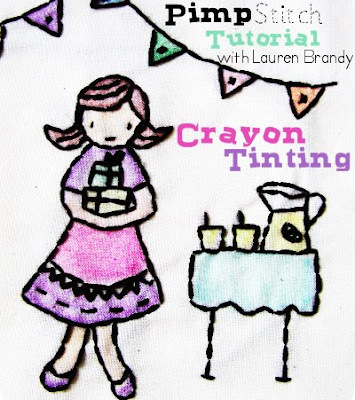 Choose 3 'little somethings' they will like to go along with the apron. Be creative, this isn't about how much money you can spend. It is about sending someone a little package with a few surprises. Some ideas include: fun cocktail napkins, recipe variations of their favorite hot drink, a kitchen/tea towel, singles of hot cocoa, tea or coffee, a bookmark or gently used novel you know they'll like, a fun hot pad in the shape of a cup or mug....etc. 3. Wrap everything in tissue with a simple ribbon before mailing.Check out their blog for hints, you may make a new friend!Deadline to sign up: Sep. 25th. I will email everyone their partners within a day or 2 after closing. Deadline to ship packages: Oct. 25th. Feel free to mail earlier though :-)Please, if you do not have the time or interest to commit to this swap, do not join.Also, if you do not mail out on time or if you flake, you will not be allowed to play again. Knows how much I lOVE aprons and she was kind enought to send me the story about Grandma's Apron! Thank You Jackie!! I don't think kids today know what an apron is. It was wonderful for drying children's tears, and on occasion was even used for cleaning out dirty ears . In the fall, the apron was used to bring in apples or pecans that had fallen from the trees. REMEMBER: Grandma used to set her hot baked apple pies on the window sill to cool. but I never heard about anyone catching anything from an Apron. 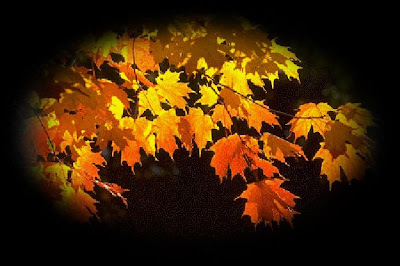 With Fall almost here I would like to give a Gold Nugget/Technique..This technique can be used for so many wonderful creations,I was thinking making Fall leaves.. I did NOT come up with this gold nugget . I have saved nuggets for years ...I do try to always get the author of them to give proper credit ...on this gold nugget I did not get the author. So sorry . If some one knows who the artists is please let me know so I can give proper credit. 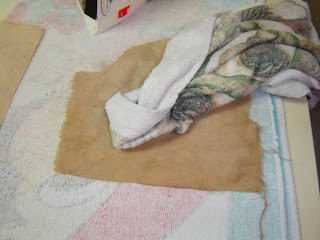 1. glue 2 pieces of brown bag (grocery bag is fine) together with Aleenes glue in the gold bottle. let dry for 1/2 hour or so..
That's it !!! It really is foolproof - if you miss a spot in burning, you can go over it with more glue and re-burn. It might take some practice getting used to the burning of the glue but so far I haven't had any disasters. I like the look for stars or small wings, looks like tarnished gold or brass. Can look like rusted metal depending on the colors of paint you use. Acrylic paints are used, by the way. 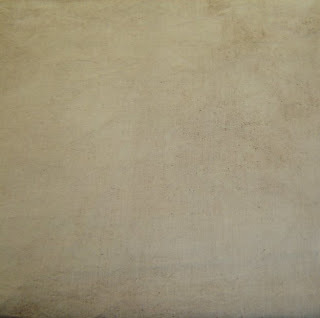 I'd like to share how I get a vintage aged look to my fabric. This is not a heavy aging or is it grunged..There is no coffee used in this aging method, There is a light clean smell of cinnamon and vanilla. 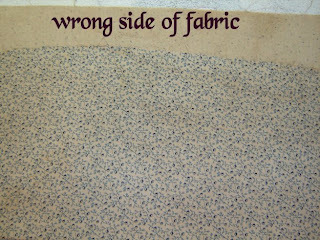 Just my own way of achieving a yesteryear look, Cloth that has been packed away for years and years. 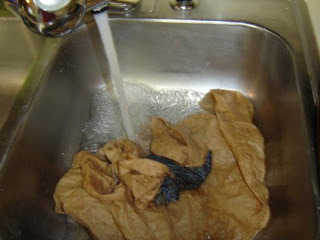 #4: Add your fabric.. Bring to a boil and then turn off heat. 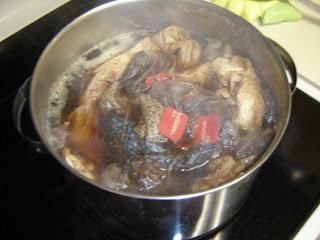 Let simmer about 30minutes. 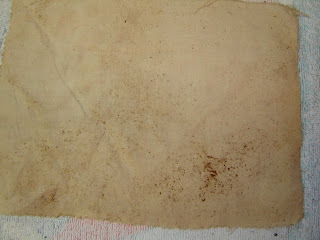 #8: This is what it will look like.. See the Cinnamon that has dried on to the fabric. 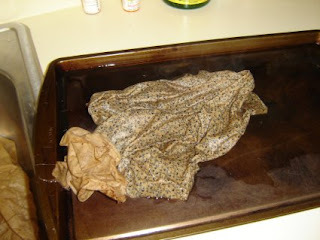 #9: Now take a terry cloth towel and wrap it around your finger rubbing the Cinnamon into the fabric and also off the fabric as you go. 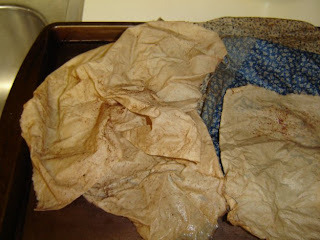 #10: Now steam iron fabric dry #11: Here is the end results, Perfectly vintage aged fabric..
See the regular muslin..this is what it looked like before aging and the darker is after aging..This is the SAME cloth..This is what I use for my doll body's..
Mrs Kwitty a VERY talented artist has created a AWSOME tutorial on her blog http://misseskwitty.blogspot.com..mrs/ Kwitty has written a fantastic tutorial on her blog about all our best friend Freezer Paper..With many extra's ,Go on over to Mrs Kwitty's and enjoy this wonderful tutorial and all her gorgeous creations too! !...Sherrie Oh:PS: I loved her light box, I have one but it is so big,I thinkk a small one would be nice size to have too:)) Okay looking for my JoAnn's coupon! Awww Fall is in the air at least in my sewing room!!!! Fall gonna be Girl ?? Boy?? Haven't decided yet. I do know this will be so very special and I'm anxiously waiting to trying a couple new techniques! Running through my mind of how I'm going to dress and embellish!! There is nothing like creating! its really neat how you can turn off worries and troubles when you just sit down and start to create. It makes you count your blessing and seeing How God is at work in our lives. 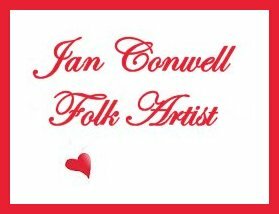 I was thinking today how creating is really a outlet, It really is a healing doing any type of hobbie whether it is sewing or counted cross stitch or knitting ,it is the creating thats so good for us! I found my body relaxing, and my thoughts were positive and creative, My faith was re-newed.Which made me have peace and joy and I felt strengthened. All our Arts are truly God given! Thats just not the right thing to say! I mean my husband has to work! It's ridiculous when you have to call your own doctor and tell him what to prescribe. so i cancled Gene's physical therapy, and did some reasearch about getting a new doctor , One that cares would be nice! So we both have an appointment at a new doctor Oct 6th. I am just praying these medications will help Gene's muscles to relax and get better be fore we see the new doctor in oct. that seems so far away.and it has been going on now 3 weeks..
#1: I will continue to stand in faith and believe for God's healing for my husband..
#2: I have lined up just a couple Fall goodies, again I 'm so Thankful to God for the love he has given me to create! I am excited about Fall and the goodies I'm making .So much that I even dream of some thing I want to make and can't wait to get going on it!!!! called " XREMEprims" So I ran over to check it out and GUESS WHAT!!!!!!! 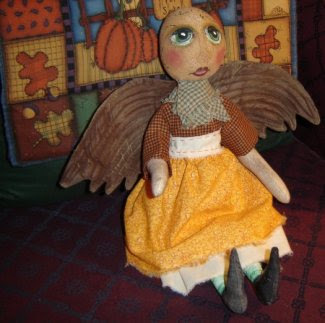 Welcome to LemonPoppySeeds.com, an exclusive gathering of Artisans and Crafters who create simple or early Primitives, Extreme Primitives, Primitive Folk Art Collectibles and Antique Primitives! There are so many talented artists at Lemon Poppy Seeds and we also have a presence on eBay …Just type in LPSX in the search box to find us there.Come by here to EXTREMEprims and visit with us and lets all get to know each other. 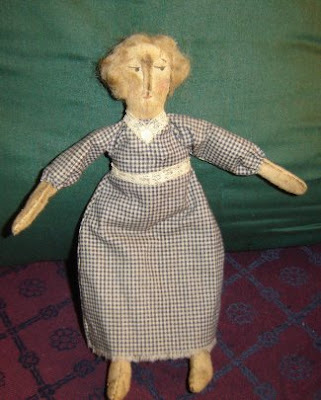 I'm having to down size my doll collections. 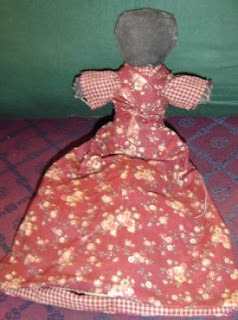 September 15th is Lemon Poppy Seeds UpDates, I have added this wonderful Prim Folk Art Colonial Style Cloth Doll as one of my offerings for this month. 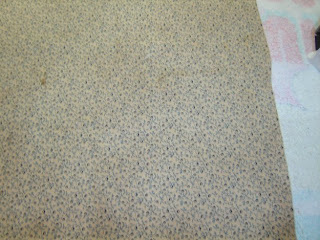 I hope you will stop by see more detail about them and enjoy all the new offerings every one has for you! Come see the many pieces and bid on wonderful handmade items. The silent auction is to raise awareness for Trisomy 18, a genetic chromosome disorder afflicting newborns. 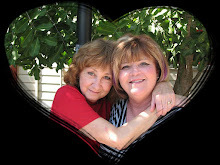 Please check out their blog http://miraclesformallory.blogspot.com/ to learn more. 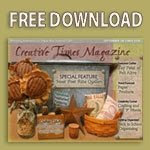 Creative Times Magazine NEW Issue is out!! Five Little Pumpkin Sitting On A GateFive little pumpkins sitting on a gate,The first one said,"Oh my, it's getting late. "The second one said,"But we don't care. "The third one said,"I see witches in the air. "The fourth one said,"Let's run, and run, and run. "The fifth one said,"Get ready for some fun. 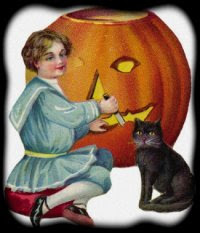 "Then whoosh went the wind,and out went the lights,And five little pumpkins rolled out of sight! I'm sitting with a nice glass of cold Green Tea just listening to the feeder bands of Hannah out side the window, Ever just felt the warm fuzziness and like to curl up with the ole computer and look and read inspirational Arts, Crafts, Other creations and just sit and smile and ooo and ahhh just with your self. 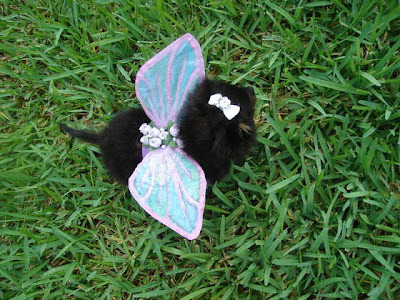 This is just so cute not only for those of us who dress our pets a bit for the holidays, But it is a great tutorial for creating neat wings for our creations too! A very special Thank You to, Linda of Simple Treasures for honoring me with this totally awesome award! #1: Put the logo on your blog. #2: Add a link to the person who awarded you. 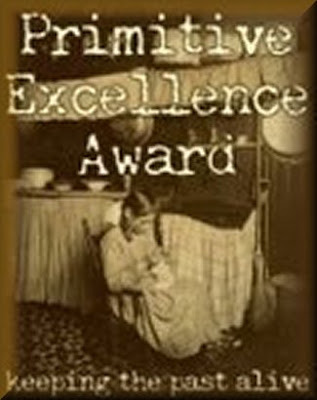 #3: Nominate at least seven other blogs. #4: Add links to those blogs on your blog. #5: Leave a message for your nominee on their blogs. 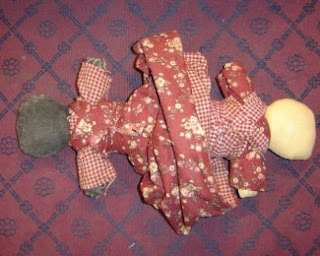 I just thought I'd let you all know I have listed on eBay two of my vintage EFA dolls from my own personal collection.. I guess from now on I will stick with my etsy!! 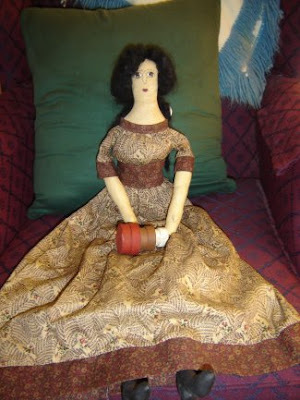 Wonderful 28 inch Primitive Victorian Style Doll,She is gorgeous!SOLD!!!! 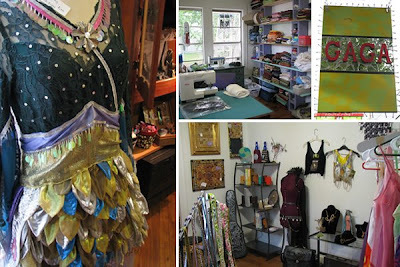 Come on over to The Humble Arts and take a peek.We are a group of artisans banded together to offer you fine handmade items with a vintage, classic look and feel. 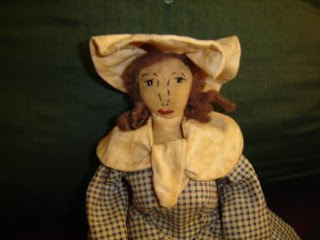 We offer various items for your perusal and purchase, including, but not limited to handcrafted dolls, signs, needlework, and some hand me downs. 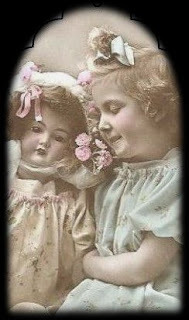 Our goal is to create original one of a kind quality items, heirlooms to be passed down from one generation to the next, dolls, rugs, etc. Nothing haphazardly thrown together but something with a lot of thought, care and of course, personality! You're Invited to DANDELION DARLINGS September 1st Exhibithttp://dandeliondarlings.com/ Welcome to DANDELIONdarlings.com, where you'll find those Country Style Primitives to Treasure ~ the ones you endlessly search for in Craft Shoppes and at seasonal Craft Shows ~ right in the comfort of your very own Home! It's another new month on A Time for Primitives. 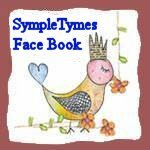 We are getting ready for the fall with brand new items, freebies, a tutorial on how to make an atc card and articles your sure to enjoy! Be sure to check to see who won The Red Witch by Howling Moon Designs!